Reaching your goals always requires an investment of some form. Sometimes it’s time. Sometimes it’s expertise. Sometimes it’s education. And sometimes it’s money. One thing that’s important to us is that we want to remove obstacles to helping you reach your goals, even if it’s a financial obstacle. So when you are considering a financial investment into your web strategy, we want to do what we can to make it easier for you. We know this kind of work isn’t always cheap, especially if you want it done right. 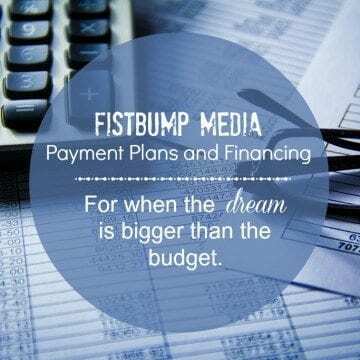 That’s why we offer easy payment plans. Our hope is that it’ll take the stress out of having a large financial burden when getting the work done that you want to do. There is no additional fee if all payments are completed on time with this schedule. For any order/invoice over $99, you have the option of using PayPal’s BillMeLater feature. Simply look for the BillMeLater icon on the invoices, and choose that option for payment. It is a financing option available through PayPal, and is subject to approval through them. This option will give you six months (no interest and no payments) to pay the balance on any purchases. Just let us know if you plan to use this option, and would like for us to invoice a total due for the project in a single invoice.